The City of Hoboken is moving forward to acquire a 6-acre undeveloped property in northwest Hoboken for use as a large “resiliency park” with at least 1 million gallons of integrated flood mitigation capacity. A portion of the property would also be designed with a municipal parking garage, potentially with rooftop recreation or other public amenities. The property is currently owned by BASF (previously Henkel/Cognis), and the project is one of three “resiliency parks” planned as part of the Rebuild by Design flood resiliency plan. The Hoboken City Council previously authorized the use of eminent domain to acquire the BASF property for open space and authorized the City’s application for low-interest funding from the New Jersey Environmental Infrastructure Trust (NJEIT) for acquisition of the property. NJEIT loans provide 0% interest on 75% of the loan amount, market rate interest on the remainder, and 19% principal forgiveness. At the upcoming Council meeting on Wednesday, September 2nd, the City Council will be asked to vote on three separate measures to 1) authorize the use of eminent domain to acquire the northern parcel of the property for a parking garage 2) authorize a $1.6 million Hoboken Parking Utility bond for land acquisition and engineering costs for detailed design of a parking structure, and 3) authorize a $16.7 million bond ordinance to acquire the larger portion of the BASF property for open space, park design and engineering costs, and for construction costs of the Southwest Park. NJEIT would purchase the bond to provide the low-interest loan to the City. Construction of Hoboken’s Southwest Park, which is also designed to hold over 200,000 gallons of stormwater runoff, is scheduled to begin this fall. An archeological review of the site needed to be completed prior to construction. The City Council previously authorized applying for a low-interest loan from the NJEIT for design and construction of the park. The final conceptual plan is available at www.hobokennj.org/swpark. The Hoboken community is invited to a public meeting hosted by the City Council Community Development Subcomittee to discuss a proposed finalized redevelopment project at 7th Street and Jackson Street adjacent to the Monroe Center as part of the Northwest Redevelopment Area. 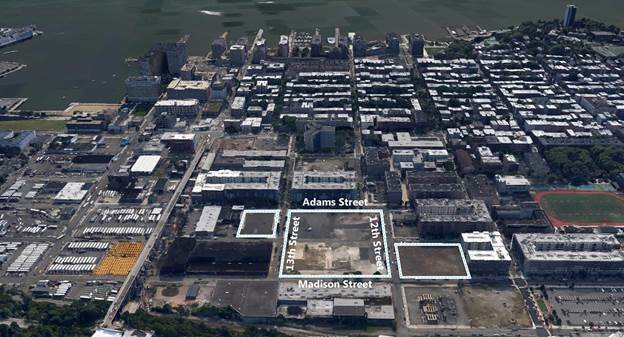 The project proposes approximately 2 acres of public parks and open space, a municipal gymnasium, advanced stormwater detention to assist in flood mitigation efforts as part of the City’s comprehensive Rebuild by Design plan, and mixed use residential and retail components along the western portion of the site, next to the Hudson-Bergen Light Rail line. The meeting will take place on Monday, August 31, 2015 at the Jubilee Center, located at 601 Jackson Street and will begin at 7:00pm with a presentation of the project followed by a question and answer period.